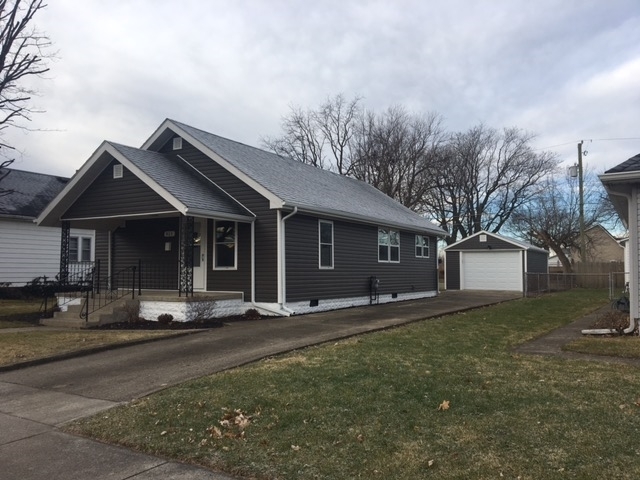 Totally Renovated, all new from the studs up, all updates include, electrical with 100 amp service, plumbing, drywall, paint, flooring, bathrooms, kitchen with appliances (stove, refrigerator), roof, siding, garage door, windows. 2 bedrooms each with their own full bathroom. Utility Room with washer and electric dryer hookup ready. Open kitchen living room. Very cute and a must see. Everything all new for the new owner. Easy to make an appointment to see. Directions:From 931 go to Markland Ave (SR 22) Right toward S Locke St, turn right off of Markland Ave to 911 S Locke home is on the left.